105 game related icons included in both black and white, in 1x and 2x sizes. Also included are spritesheets and vector source files. Arrows, audio, menu, bars, basket, buttons, shopping, checkmark, contrast, cross, exit, exclamation, import/export, video, gamepad, settings, home, information, joystick, leadboards, lock, singleplayer, multiplayer, grid, medal, mouse, power, play/pause/stop, scroll, save, star, signal, trophy, trashcan, warning and zoom. Very cool. Are the vector files AI, EPS or SVG? You may want to put it in the description. Very nice! Thanks a lot! It would be nice if the Sound Off icon also included a diagonal bar like the Music Off icon, so they would be more similar. Kenny for the rescue! Also this website is getting better and better! Thank you for making it! How I will get the license to use this art. can you please make a separate svg file each icon? if not all then audio, leaderboards and the one in third column and third row, thanks! This asset looks really good but since you added A,B,X,Y(XBOX) why did you also add L1,R1,L2,R2(PlayStation) instead of LB,LT,RB,LB(XBOX)? 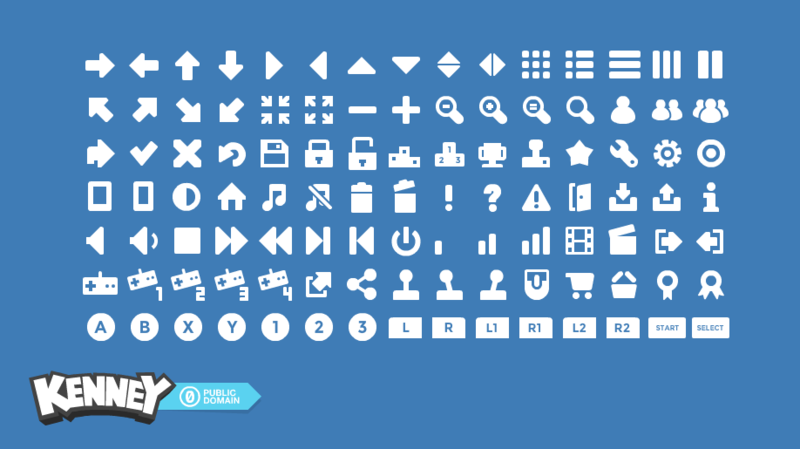 Also this asset would be even better if you fixed that and added two mouse icons (the one indicating the left button and the other indicating the right button).